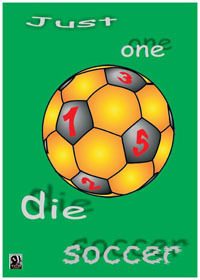 Just One Die Soccer is a solitaire statistical, replay-oriented game on Soccer. It is based on the comparison between the goal for and against for the two teams involved in the match, with several additional options (as random period of form, etc.). After a few simple calculations, each game is resolved with a single die roll: so it is possible to replay a season in one sitting. Basic game comes with rulebook, charts, Italian Serie A 200/2009, Swiss Superleague 2008/2009 and Austrian Bundesliga 2008/2009. More seasons and leagues soon to come.